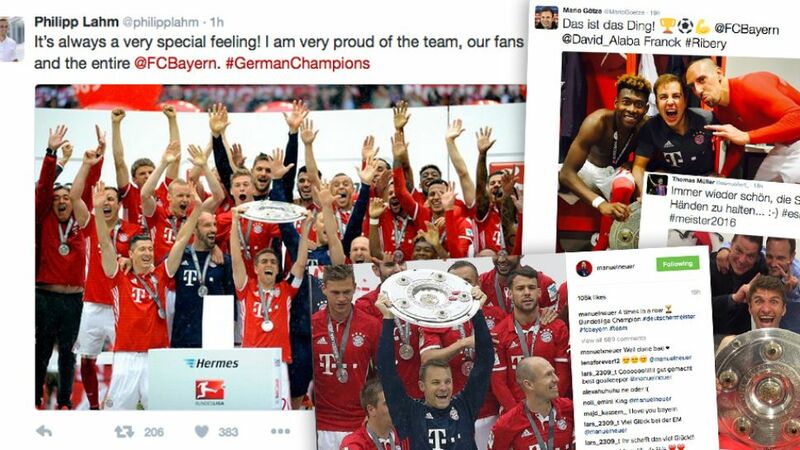 After being presented with the Meisterschale for the fourth consecutive season on Matchday 34, FC Bayern München stars shared unique insights into the title celebrations with fans around the world on social media. The celebrations got underway in earnest after Bayern's final day 3-1 over Hannover 96. After being presented with the Meisterschale, the Bayern stars partied the night away before showing off the trophy to thousands of fans in Munich on Sunday. At the official party, Jerome Boateng and David Alaba caught up with OneRepublic, who played during the half-time show. Thomas Müller tweeted "it's always nice to hold the trophy in your hands..."
Robert Lewandowski got his hands on a further trophy as well, lifting the Torjägerkanone as top scorer in the Bundesliga after becoming the first player since 1977 to break the 30-goal barrier.